Aug. 31 — Wage and hour investigations were on the menu at thousands of fast-food franchises during the Obama administration, pulling in millions of dollars in back pay for workers. 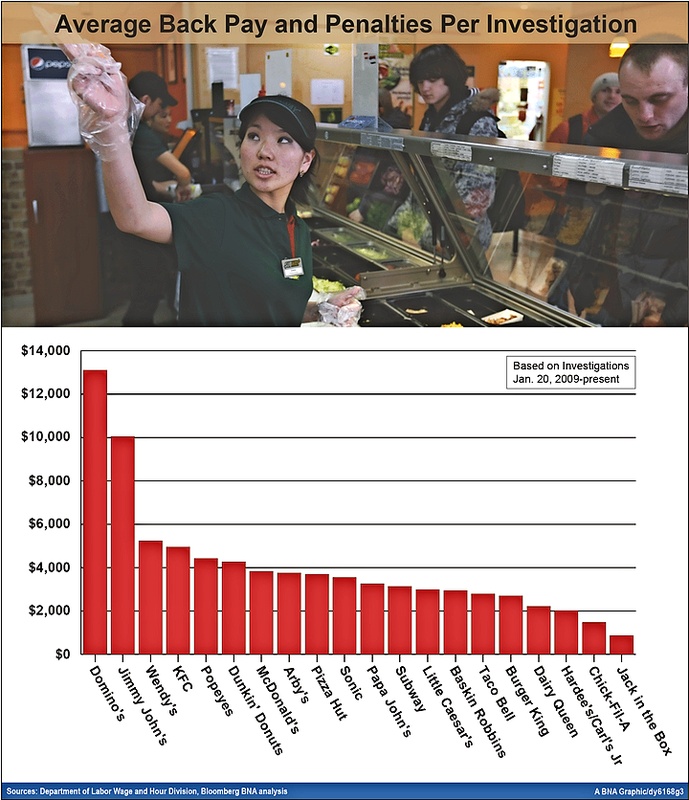 Since President Barack Obama took office, the Labor Department’s Wage and Hour Division has subjected the nation’s three largest quick-service restaurants by volume of stores—Subway, McDonald’s and Dunkin’ Donuts—to 2,023 investigations. That’s more scrutiny than the next 17 biggest fast food brands experienced combined, according to a Bloomberg BNA analysis of WHD enforcement data. The division conducted 1,298 Subway investigations, or 4.3 percent of the sandwich-maker’s 27,000 stores, when factoring for repeat cases, a review of concluded WHD cases shows. This led to findings of 18,107 Fair Labor Standards Act violations—mostly for minimum wage and overtime pay owed—and $4.1 million in back wages to workers and penalties assessed. The division’s focus on fast food, an industry employing some 4 million workers, predates the current administration. The numbers reflect a concerted agency focus in recent years to bring widespread industry compliance by repeatedly inspecting franchisees at the leading fast-food companies. Quick service restaurants pay nonsupervisory employees an average of about $9 per hour, according to DOL figures. However, to some industry representatives, the number of investigations doesn’t indicate massive noncompliance because many cases lead to findings of no violations or low dollar-figures recovered via settlement. Since Jan. 20, 2009, investigators handled 450 McDonald’s cases (2.9 percent of the 14,344 locations), leading to $1.7 million in back wages and penalties assessedand 11,163 violations. The third largest of the group, Dunkin’ Donuts, saw 275 investigations (3.3 percent of stores), resulting in $1.1 million in wages and penalties recovered from 2,530 FLSA violations. 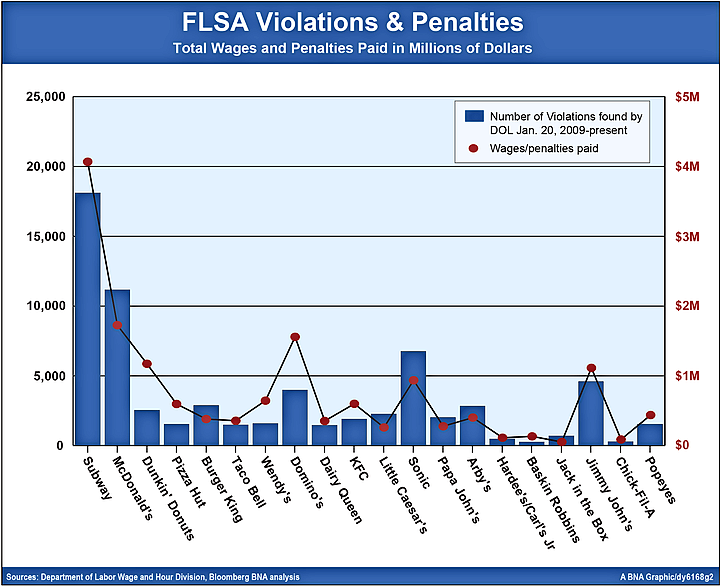 The big three also nearly kept up with the next 17 fast-food places combined in terms of number of FLSA violations (31,800 at the big three versus 36,544), total back wages and penalties assessed ($7 million versus $8.3 million) and number of employees receiving back pay (26,305 versus 30,776). Michael Hancock, who previously was the WHD’s assistant administrator for policy in this administration, told Bloomberg BNA that the enforcement activity and noncompliance numbers reflect the agency’s allocation of limited resources in high-violation areas, as well as pressure on franchise owners to cut labor costs. “You know the old saying, ‘You fish where the fish are.’ Well, they’re getting pretty good at knowing where the fish are,” said Hancock, who is now of counsel at plaintiffs’ firm Cohen Milstein Sellers & Toll PLLC in Washington. He left his DOL post in February 2015. 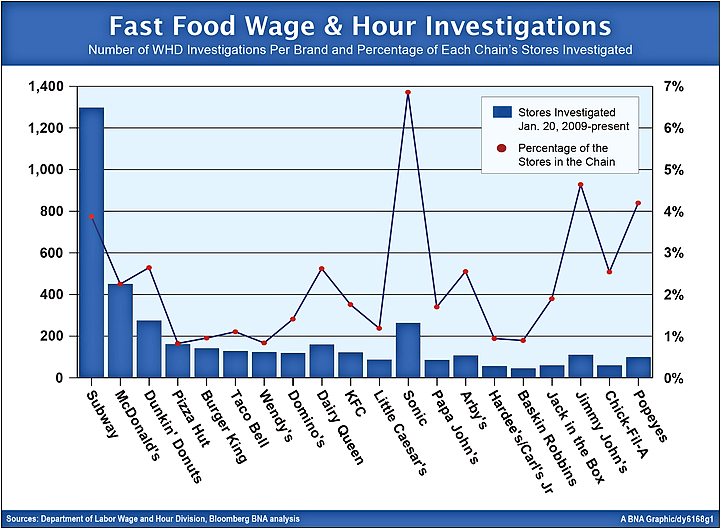 Instances of fast food “wage theft” commonly described by plaintiffs’ attorneys and agency officials include forcing employees to work before and after their shifts or during their lunch break, leading to overtime violations, and deducting uniform costs or cash register shortages from paychecks, leading to failure to pay the minimum wage. Several weeks ago, Subway moved to address the issue of wage violations at its 100 percent franchised network by signing a voluntary agreement with the WHD to help franchisees improve FLSA compliance. The division, citing widespread worker abuses in the restaurant industry, is attempting to reach similar arrangements with other national retail food franchisers. The agency won’t name which companies it has approached about other similar partnerships. But a review of the WHD’s public enforcement database shows the brand names that have received the most attention from the agency in recent years and which companies’ stores are taking the heftiest financial losses as a result of those cases. And it wasn’t only the three largest brands under the microscope. Sonic Drive-In only made No. 12 on the list but was the most frequently investigated chain among the top 20. Nearly 7 percent of Sonic’s 3,518 units received a WHD investigation during the Obama presidency. Jimmy John’s is now the 18th biggest chain (2,109 stores) and has paid $1.1 million in wages and penalties from WHD investigations during this administration. That was the fourth-highest dollar total among the top 20, trailing only the big three. Jimmy John’s and Domino’s also distanced themselves from the pack in amount paid per investigation. Domino’s Pizza locations paid an average of $13,104 per each WHD investigation while Jimmy John’s stores averaged $10,040 per case. The third-highest total per investigation on the list was Wendy’s at $5,241, and most of the remaining brands paid an average of less than $4,000 for each investigation. These totals stem almost entirely from back pay to employees for minimum wage and overtime owed, while a small share comes from child labor penalties and civil monetary penalties, which are paid to the DOL. The variation among companies doesn’t necessarily correspond to differences in each brand’s FLSA compliance level. During this administration, the WHD has increasingly targeted investigations in workplaces deemed most likely to yield violations and wages recovered for vulnerable workers, Weil has said. Rather than focusing on responding to complaints, an agency regional office may review the results of a prior year’s Sonic cases, and decide that it makes sense to investigate neighboring Sonic stores. Overall, investigators found at least one violation in more than three-quarters of cases at fast food establishments, the data showed. Many of the investigations during this administration concluded with small amounts of back wages paid, in some instances less than $1,000 divvied up among affected employees. When the findings are fairly minimal, it would signal that the store owners likely decided it wasn’t worth the time and money to challenge the allegations in court, Tammy McCutchen, WHD administrator under President George W. Bush, told Bloomberg BNA. McCutchen represents some of the franchise brands in the dataset and also advises the International Franchise Association. The IFA, whose members include most of the top-20 fast-food brands, argues that franchisees are independent entities that are individually responsible for ensuring FLSA compliance. Although Subway franchises out all of its stores and McDonald’s says it does so for most locations, other leading fast-food companies have a higher share of units that are franchiser-owned. Dunkin', which is almost entirely franchised, said the enforcement numbers reflect a small share of its more than 8,000 stores. The DOL “data represents a very small percentage of cases per year involving the Dunkin’ Donuts franchised system,” Karen Raskopf, the company's chief communications officer, told Bloomberg BNA in an e-mail. “However, we and our franchisees, who are solely responsible for all employment decisions at their restaurants, take these matters seriously and are committed to the well-being and fair treatment of all crew members,” she said. Representatives for Subway and McDonald's didn't respond to Bloomberg BNA's requests for comment. The figures come from Bloomberg BNA’s review of concluded WHD investigations uploaded onto the department’s public enforcement data website. The dataset, which covers only violations of federal statutes, was last updated in June and is refreshed on a quarterly basis. The analysis relies on the violations’ end date as a proxy for when the WHD began an investigation, thereby capturing as many cases initiated under the current administration as possible. The database only lists dates the violations occurred, without disclosing the exact start date of an investigation. But the findings' end date is very close to the time when investigators begin their probe, a Labor Department spokesman told Bloomberg BNA. For instance, investigators may begin a case Sept. 1, find back wages owed for the prior three years, and calculate the violations through the date the investigation began. The data doesn’t necessarily reflect all cases concluded at the leading fast-food companies because investigators enter information in the dataset using a variety of trade names for each brand. The figures include investigations resolved administratively and through DOL litigation, but don't cover privately litigated cases.